In the fourth quarter of 2018, general government's consolidated total revenue grew by EUR 0.2 billion compared with the corresponding quarter of the previous year. Consolidated total expenditure increased by EUR 0.8 billion from the previous year’s corresponding quarter. The difference between revenue and expenditure, that is, the net borrowing of general government rose by EUR 0.6 billion. Total revenue decreased by 0.3 per cent from the previous quarter. Total expenditure declined by 0.5 per cent from the previous quarter. In the fourth quarter of 2018, the general government deficit (net borrowing) stood at EUR 3.3 billion. 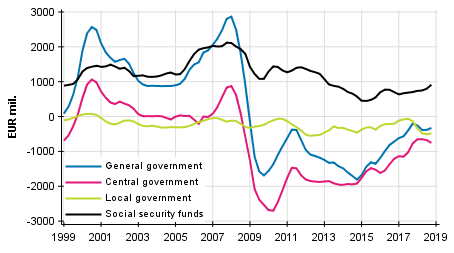 These data derive from Statistics Finland’s statistics on general government revenue and expenditure by quarter. General government is comprised of central government, local government and social security funds. Examinations of year-on-year changes are made with figures unadjusted for seasonal variation. In the fourth quarter, central government's total revenue amounted to EUR 14.6 billion and total expenditure was EUR 16.0 billion. Central government's total revenue went up by 2.4 per cent from the respective quarter of the year before. Correspondingly, central government's total revenue went up by 2.3 per cent from the respective quarter of the year before. The difference between revenue and expenditure, that is, the central government deficit was EUR 1.4 billion. Local government's total revenue was EUR 11.2 billion in the fourth quarter. It decreased by 2.6 per cent from the respective quarter of the previous year. The revenue items that increased most were sales of non-market goods and current transfers received. In turn, the revenue items that declined most were income taxes received. Local government's total expenditure was EUR 13.7 billion in the fourth quarter. It went up by 4.2 per cent. The expenditure items that grew most were gross fixed capital formation and wages and salaries. The difference between revenue and expenditure, that is, the deficit (net borrowing) of local government grew by EUR 0.9 billion and amounted to EUR 2.5 billion. Social security funds include employment pension schemes and other social security funds. In the fourth quarter, employment pension schemes' total revenue amounted to EUR 7.2 billion and total expenditure to EUR 6.8 billion. Total revenue increased by EUR 0.3 billion or by 4.4 per cent from the corresponding quarter in the year before and total expenditure grew by EUR 0.3 billion or by 4.2 per cent. The revenue items that grew most were social contributions received, and in expenditure, paid social benefits other than social transfers in kind. The difference between revenue and expenditure, that is, the surplus (net lending) of employment pension schemes remained unchanged from the corresponding quarter in 2017, being EUR 0.3 billion. Other social security funds' total revenue was EUR 4.9 billion in the fourth quarter. Total revenue rose by 2.4 per cent from the corresponding quarter of one year ago. Total revenue increased despite the reduction in employers’ social contribution rate due to growth in income transfers received from the state. The expenditure of other social security funds amounted to EUR 4.6 billion and it fell by 2.4 per cent from the quarter last year. The expenditure item that decreased most was paid social benefits other than social transfers in kind. The difference between revenue and expenditure, that is, the surplus (net lending) of other social security funds was EUR 0.3 billion in the fourth quarter. Examinations of changes compared with the previous quarter are made with seasonally adjusted figures. Central government's total revenue went up by 0.7 per cent from the previous quarter. Central government's total expenditure increased by 1.2 per cent from the previous quarter. Local government's total revenue went down by 0.9 per cent from the previous quarter. In turn, local government's total expenditure remained unchanged in the fourth quarter. Employment pension schemes' total revenue went up by 0.7 per cent and total expenditure grew by 0.3 per cent from the previous quarter. Other social security funds' total revenue went down by 2.9 per cent and total expenditure fell by 1.6 per cent from the previous quarter.. The data for the two latest years are preliminary and will become revised as annual national accounts data are revised. Seasonally adjusted and trend time series have been calculated with the Tramo/Seats method. Seasonally adjusted and trend time series always become revised against new observations irrespective of whether the original time series becomes revised or not. Further information on the seasonal adjustment method: http://www.tilastokeskus.fi/til/tramo_seats_en.html As the time series of annual national accounts become revised, the time series of this set of statistics will also be revised. These data are based on the data sources available by 11 March 2019. The data will be next revised on 20 June 2019. Official Statistics of Finland (OSF): General government revenue and expenditure by quarter [e-publication]. ISSN=1797-9382. 4th quarter 2018. Helsinki: Statistics Finland [referred: 19.4.2019].